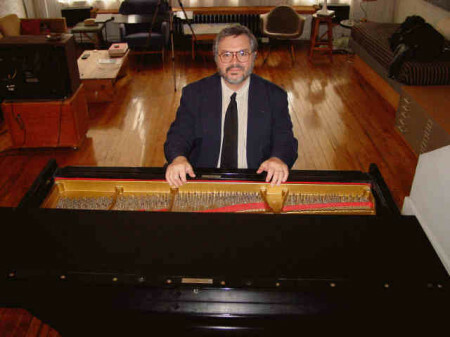 Frank Abbinanti is a pianist and composer from Chicago specializing in contemporary music and the experimental tradition. As an interpreter, his repertoire ranges from Ives to Feldman to the current generation of Americans and Europeans, with a particular affinity for more politically engaged composers such as Cornelius Cardew and Christian Wolff. For this concert, Abbinanti will perform his own work, Jenin, as well as music by Douglas Ewart, Cornelius Cardew, and Ralph Shapey. Born in Jamaica, Douglas Ewart has long been a member of Chicago’s Association for the Advancement of Creative Music, in which he founded numerous improvising ensembles, such as the Clarinet Choir. AACM’s working premise has been to enrich the language of African-American music with innovation, gesture, ritual, and experimentation, all the while acknowledging its historic expressions from jazz, blues, gospel, pop, and the avant-garde. Red Hills (1984) is a graphic score to encourage improvisation. It is a “dangerous” piece in that you need to do something very interesting with the various graphic shapes and rhythms and one scale provided in the score. For me, the work is like a passacaglia, in that the graphics anchor you down to specific rhythms and energy-bound gestures. But unlike a passacaglia, you never sense a tyranny of the bass line reiterating itself throughout the work. Instead, there should be a free flow of highly combustible energy that pervades and animates the work throughout. Cornelius Cardew (1936-1981) is especially known for his work Treatise, a 193-page score of impeccable musical graphics from the late 60s. A protégé of Cage and Stockhausen, he soon abandoned the avant-garde for its elitism and indifference to the political situations of the world, embracing Leftist politics and co-founding The Scratch Orchestra, an interdisciplinary group of musicians, poets, and performers of all kinds and shapes. We Sing for the Future (1981) is a piano arrangement of Cardew’s song of the same title, intended to be sung in a community setting. Those who have sung it at rallies and demonstrations claim that the tune closely resembles an Eton boating song, and that Cardew had to know of this origin. The piano version is about 11 minutes and was written in an accessible, post-romantic musical language, very much like Schubert, with the typical British interest in tonality and the pure aesthetic of musical timbre. At the time, Cardew was searching for a very accessible music to present at worker meetings and functions, benefits and fundraisers, and as a means of enriching this radical culture. Now I like to contemplate the work within a prism; rather than simply playing it from beginning to end as written, I prefer to perform this music as if Cardew had perhaps rewritten sections of it, or revised it entirely. I add my own improvised musical ideas, like cadenzas, interruptions in and around and through it in real time, as an ongoing commentary, as one voice speaking to another, like a dialogue, a musical reflection through time. Ralph Shapey (1921-2002) received numerous prizes throughout his long career, including a MacArthur Fellowhip in 1982. I studied composition and conducting with him in 1975 at The University of Chicago, though I wasn’t very good at writing the style of atonal, 12-tone music he encouraged. He would exclaim that whatever I wrote had no meaning, and I didn’t know what he meant by that. I still don’t ! But I respected his deep sense of musicianship; seeing him conduct, with his impeccable sense of rhythm, was a powerful experience. I once thought that there must be some mystical, opaque, or unexplainable element to his music, but it is quite analyzable; every note, every moment has a meaning, a “function” (a word he was fond of). His sense of the power of sound, like the moving of plates beneath the earth, is compelling as well. It’s as if every work is marked or stamped, wrought like steel within very predictable sonorities, very direct. His Passacaglia (1982) is derived from the Baroque musical form. He believed that traditional forms needed to be revisited, nurtured, like a man tending his garden each morning. Yet he did so with a deeply modernist sense of extremes, complexity, and subversion, and so we can hear the thunderous, roaring power of the “passacaglia” idea in the lower parts of the piano. I like to play this piece, even though it is really a work for orchestra, and the voicings and linear placements are awkward. Yet that’s why it is interesting to me. The entire keyboard is utilized here. It encourages the pure satisfaction of sound, of timbre, a fully resonant piano, exploring the extremes of rhythm, of timbre, of conception, and has a raw, almost unfinished quality. But, like all of Ralph’s music, it unfolds within clear classical shapes and gestures. Frank Abbinanti (1949) is a composer of primarily chamber, vocal and piano works that have been performed in Europe and North America; he is also active as a pianist and trombonist. He studied trombone privately with Frank Crisafulli, and piano at the American Conservatory of Music. He then studied composition and performance art with Richard Teitelbaum and piano with Frederic Rzewski at the University of Illinois in Urbana-Champaign. He also studied composition with Ralph Shapey and Ben Johnston. Abbinanti currently lectures part time at the University of Chicago, the Graham School, the Newberry Library, and the Merit School of Music in Chicago. His music has often engaged a political or historic image, event or text, as a means of inspiration, gesture and structure of a work. Jenin (2002) is really a recorded piece for two multi-tracked pianos, but can be realized as a piano solo. The title refers to the town and refugee camp in the West Bank that was bombarded and occupied by Israeli military forces in April/May, 2002. It is a response, a commentary and dialogue toward obtaining, suggesting, contemplating a lasting peace there. The titles of the various movements suggest the region’s history, and are an expressive means for contemplating this conflict. The work’s structure is the loose, undefined reiteration of musical ideas, in which the movements are not always self-contained, but share material in a fluid relation, a topology of image and gesture of past, present, future, past, present. Movements are sometimes structured around specific tones that at times suggest melodies from the Middle East, though no specific Israeli or Palestinian song is actually ever utilized.